The Wort Report: First Look: Henry Cavill as Superman! First Look: Henry Cavill as Superman! This Man of Steel publicity still of Henry Cavill wearing Superman’s iconic threads has been making comic book geeks lose their mind all day, and deservedly so. Judging by the shot, director Zack Snyder’s going to be putting a lot more emphasis on action this time around, which should be a welcome change of pace after Bryan Singer decided to make The Last Son of Krypton mope around for about 30 minutes too long in 2006’s Superman Returns. Now, Cavill as Superman? He certainly looks the part, even though Superman’s iconic “S” spit curl seems to be missing and the suit looks like it might have more of a scaled texture to it than the spandex we’re used to. However, this graphic—with all of its sparks and twisted metal and unnatural light—suggests that Snyder is still giving in to his excessive stylistic urges. This means we’ll likely see an abundance of slow-motion action scenes and CGI environments which, after his polarizing Watchmen and his bizarre Sucker Punch, might not be received all that well by casual audiences. We’ll see. 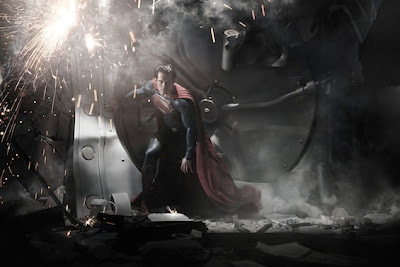 Man of Steel is scheduled for release on June 12, 2013.